If you have small children, pets, or entertain in your home a lot, you know firsthand just how difficult it can be to keep your carpet looking brand new. Spots, spills, & odors can add up over time, and your carpeting can become lackluster and appear dingy- but there are steps you can take to extend the life of your carpeting, and succeed in making it look new again. Aside from your own routine spot cleaning and vacuuming, you should also consider getting your carpets professionally cleaned. Professional cleaning services can bring your carpet back to life, and provide the deep, permeating cleaning that consumer-grade products just can’t match. Many professional carpet cleaning companies will use different cleaning methods, and it is important to find out which will be used in your home: steaming, shampooing, or dry chemical cleaning. Also ask how long your carpet will need to remain unused. Hiring a professional company to clean your carpet is the safest and most effective route to take when dealing with heavy soiling and/or odors. 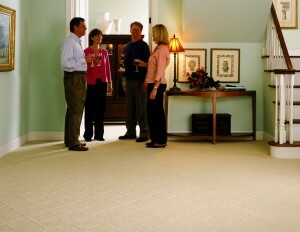 It is a worthwhile investment that will keep your home’s carpet looking newer, longer.